I guess this is the tradeable horde side Brawler's Guild invite. Probably purchasable in Brawl'gar Arena after you get the Black Market Auction House version of it. EDIT: Found out one source of them, apparently, once you hit a certain rank (Probably 8), you get mailed one. Here's a screenshot. You've gathered quite a following down at Brawl'gar! I'm kinda curious to see what your friends can do. Here's an invitation to give out. Let's get some new blood in here! Just got this item, got to rank 7 in no time at all, A lot of fun ! Here's the real question -- can you ever obtain a second one? Once a week? Once a month? EVER? I don't want to sell these, but I wouldn't mind saving my friends some money, either. Note: Hitting level 7 with the Brawler's Guild will give you ONE (1) pass to invite a friend to the guild. One. That is currently the max number of people you can invite. So be sure to pass along this information to all the people yelling, "invite to guild plz!" Using this item triggers a very ominous soundbite to play. 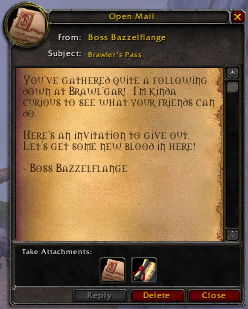 If you are wondering, Blood-Soaked Invitation is account-wide, too, and unlocks all your characters for brawlers guild. There is no need to buy this item if you already have the other one. Got my Brawler's Pass from Durg Spinecrusher on my first try. As of 7.1.5, the Brawler's guild has returned for Legion. This item is now a reward from the achievement The Second Rule of Brawler's Guild (Season 3), for hitting rank 4. The Blood-Stained Invitation can be obtained randomly from dungeons or emissary caches, or as a drop from the elite vrykul on the island of Shield's Rest in Stormheim. They aren't too hard to get ahold of, so I doubt the Brawler's Pass will sell for much beyond the first couple days. Got an Blood-Soaked Invitation invite from farming Helarjar Berserker and Helarjar Soulkeeper elites in Shield's Rest Stormheim, running down to the hall. This item will be converted to Brawler's Pass if you transfer to Alliance.